At the time of Kennedy's historic pronouncement, the booster vehicle program was still in flux. The Saturn rocket was considered a multi-purpose vehicle, and the Department of Defense was still planning Earth-orbital missions using Dyna-Soar. During the summer and fall of 1960, NASA and Air Force executives were still engaged in mission studies using Dyna-Soar as a payload for Saturn.1 By January 1961, the DynaSoar appeared to have won an even stronger place in Saturn mission studies. In a planning session at Huntsville, the second stage of the Saturn C-2 configuration study was firmed up as to trajectory, performance, and structural considerations. All of these parameters derived from a Saturn and Dyna-Soar vehicle combination with the Dyna-Soar as the upper stage.2 Yet the C-2 configuration itself was only a paper study, and Saturn configurations changed rapidly in the early months of 1961. Early design concepts of C-1 and C-5 versions of the Saturn launch vehicles. The stable of NASA launch vehicles that were actually built and flown. ....engagements among various NASA centers and within Headquarters. The struggle in reaching the final decision also suggested some of the problems to be faced by NASA management when one center had responsibility for the launch vehicle and another organization had the payload. The problems were compounded when both were trying to fashion programs and develop hardware without always knowing what each would require in the end. Perhaps part of the problem was STG's lesser standing vis-a-vis Marshall as a full-fledged center. This aspect was improved in January 1960, when STG became a separate field element, reporting directly to the NASA Director of Space Flight Programs, Abe Silverstein. As Director of STG, Gilruth had his own staff of some 600, still physically located at Langley. With a new organizational structure and bureaucratic independence, STG was authorized to conduct advanced planning studies for manned vehicle systems, as well as to establish basic design criteria. STG also had authority to assume technical management of its projects, including the monitoring of contractors. By November, STG became even more independent when it was officially redesignated the Manned Spacecraft Center (MSC),16 and plans were being made to transfer MSC to its new location near Houston, Texas, by the middle of 1962. Naturally, all concerned hoped that the joint groups would promote understanding and reduce friction. That the Apollo-Saturn program succeeded as well as it did testifies to the value of such efforts, but this is  not to say that differences of opinion were always easily and quickly adjusted. The issue of EOR versus LOR, for example, brought Marshall and the Manned Spacecraft Center into head-on conflict. Left, John C. Houbolt goes through his chalk talk on the advantages of lunar orbit rendezvous over competing modes. Below, the typical mission profile using lunar orbit rendezvous. The issue of how to achieve a lunar landing at the earliest date became a principal theme in the Rosen group's deliberations. Although rendezvous offered an early possibility of a manned lunar landing, Rosen's working group noted that actual rendezvous and docking experience would not be available until 1964. LOR also seemed the riskiest and most tricky of the rendezvous modes, and the group expressed a decided preference for EOR. Either way, a C-5 Saturn with five F-1 engines in the first stage was the recommended vehicle. In spite of all the discussion of rendezvous, the Rosen committee in the end favored direct ascent as opposed to either EOR or LOR. "The United States should place primary emphasis on the direct flight mode for achieving the first manned lunar landing," the report flatly stated. "This mode gives greater assurance of accomplishment during this decade." Therefore, the Nova vehicle "should be developed on a top priority basis. "23 The trend toward LOR strengthened, however. Even though EOR became the "working mode" for budgetary planning for 1962, the debate went on. The evidence suggests that von Braun increasingly felt the necessity of settling the issue so that they could get on with definitive contracts for launch vehicles and other hardware with long lead times.28 Resolution of the EOR-LOR controversy finally came on 7 June 1962, when Shea and his aides were in Huntsville for still another session on the mode of rendezvous. In his concluding remarks, von Braun noted that the conference had given six hours of intensive analysis to various proposals, including Nova-direct as well as EOR and LOR. They all appeared to be feasible, von Braun commented; the problem was narrowing the choices to one and then acting on it. "It is absolutely mandatory that we arrive at a definite mode decision within the next few weeks, preferably by the first of July 1962," he declared. "We are already losing time in our overall program as a result of lacking a mode decision." Then von Braun announced that LOR was Marshall's first choice. There were complex technological, economic, and administrative reasons for Marshall's ultimate decision to go along with LOR. 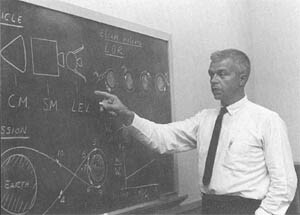 Although von Braun elaborated on 11 principal reasons for choosing LOR, the basic consideration involved confidence that it provided the best chance for a successful manned lunar landing within the decade. The concept promised good performance margins. Separation of the lunar lander from the reentry vehicle seemed desirable from many considerations of design and operation, and the overall concept suggested good growth potential for both the lander and the booster. Von Braun also implied that both sides could work together without the potential friction of an "I told you so" attitude. The fact that he felt compelled to proffer such a verbal olive branch suggests that the heat generated by the EOR-LOR debate must have been considerable. The MSFC Director observed that "the issue of 'invented here' versus 'invented there' does not apply," because both MSC and MSFC, in effect, adopted an approach originally put forth by Langley. "I consider it fortunate indeed for the Manned Lunar Landing Program that both Centers, after much soul searching, have come to identical conclusions," von Braun emphasized. "This should give the Office of Manned Space Flight some additional assurance that our recommendations should not be too far from the truth." Even with von Braun's imprimatur in June, the irrevocable decision for LOR did not come until the end of 1962. The Huntsville conclave produced agreement at the center level only; NASA Headquarters still had to formalize the choice and implement the decision. Early in July, Seamans, Dryden, Webb, and Holmes concurred with a recommendation for LOR by the Manned Space Flight Management Council, but the President's Scientific Advisory Committee still actively questioned the LOR mode. The committee evidently preferred the EOR approach because it felt the technological development inherent in the EOR concept had more promise in the long run for civil and military operations; its argument also suggested that the LOR choice stemmed from internal NASA expediency-as the cheapest and earliest mission possibility-even though technical analysis of LOR was incomplete. Nicholas Golovin and Jerome Wiesner, in particular, remained adamantly against LOR, and the controversy actually boiled over into a public exchange between Wiesner and NASA officials at Huntsville while President Kennedy was touring Marshall Space Flight Center in September. 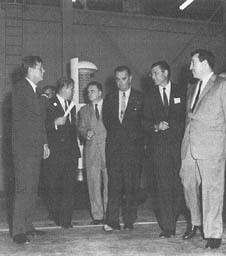 President Kennedy's visit to MSFC in September 1962 provided a forum for discussion of LOR: from the left, the President, MSFC Director Wernher von Braun, NASA Administrator James E. Webb, Vice-President Lyndon B. Johnson, Secretary of Defense Robert S. McNamara, and the President's Science Advisor Jerome B. Weisner. After a final round of studies, James Webb reaffirmed full commitment to LOR on 7 November and named a prime contractor, Grumman Aircraft Engineering Corporation, to build the lunar module.31 Thus, by the end of 1962, the outlines of the Apollo-Saturn program were firmly delineated, with agreement on a family of three evolutionary Saturn vehicles, a functionally designed spacecraft, a technique to land men on the lunar surface, and a technique to return them safely to Earth. The Saturn program created a vast new aerospace enterprise, partly private and partly public, with MSFC directing a group of facilities whose extent far exceeded anything in the days of the old NACA. 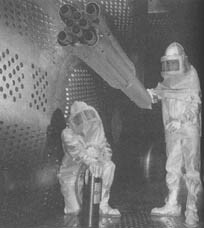 The federally owned facilities under Marshall's immediate jurisdiction eventually included the sprawling installation at Huntsville; the cavernous Michoud Assembly Facility (MAF) at New Orleans; the huge Mississippi Test Facility (MTF) at Bay St. Louis, Mississippi; and the Slidell Computer Facility at Slidell, Louisiana. Other government-owned facilities directly related to the Saturn program included the NASA Rocket Engine Test Site at Edwards  Air Force Base in California and the government-owned production facilities for the S-II second stage at Seal Beach, California. The growth of Marshall Space Flight Center at Huntsville began almost as soon as the transfer of the von Braun team from the Army Ballistic Missile Agency in 1960. This shift involved some 4.8 square kilometers of land (within the 162 square kilometers of the Redstone Arsenal) and facilities valued at $96 000 000, along with 4670 employees from ABMA's Development Operations Division. (For subsequent figures on manpower, plant value, etc., see the appendixes.) Settling in its new role, MSFC evolved as a facility of three distinct sectors, divided into an administrative and planning area, an industrial area, and test area. Although the transfer gave NASA the bulk of the land and facilities previously used by ABMA's Development Operations Division, von Braun's administrative staff was allowed to remain in their old ABMA offices on a temporary basis only, and a Saturn-sized test area was needed. Construction began on a new administrative complex and the first MSFC personnel took occupancy during the spring of 1963. Of the several approaches to the center, perhaps the most impressive was from the north. Driving several miles through the green pastures and wooded, rolling hills of the Alabama countryside, a viewer watched the administrative complex looming ever larger. Three multistory buildings were arranged in a "V" shape, with Building 4200, the tallest of the three, proudly riding the crest of a low hill. With the U.S. flag snapping smartly from its pole, this impressive office complex rising out of the rural landscape rarely failed to impress visitors. As director of the Marshall Space Flight Center, von Braun, with his staff, occupied office suites on the top two floors of Building 4200, irreverently known as the "von Braun Hilton." 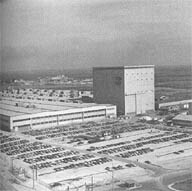 Except for the lawns and plantings around the administrative complex, Huntsville always had a factory look about it. Crisscrossed by streets and railroad tracks, Marshall still bore the stamp of its heritage as an Army arsenal, with lean, utilitarian structures, linked together by a web of electric and phone lines supported by ubiquitous poles. Buildings in the industrial area were frequently flanked by ranks of high-pressure gas bottles, cranes, hoists, and assorted large rocket components. A visit to the Manned Spacecraft Center at Houston, with its sleek, ultramodern office complexes and well-tailored inner courtyards (complete with ponds and rocky little streams) was a study in contrasts. When Marshall was organized in 1960, the Army launch team under the direction of Kurt Debus became the Launch Operations Directorate, Marshall Space Flight Center. At the Army's Missile Firing Laboratory, the Debus team had been launching a series of Army vehicles, including Redstone and Jupiter, and had launched the first American Earth satellite, Explorer I. In the months following the transfer to NASA, they launched the manned Mercury-Redstone suborbital flights. As plans for the Saturn series were finalized, the Launch Operation Directorate, through Debus, participated in the search for a new launch site, large enough and removed far enough from population centers to satisfy the physical requirements of the big new space boosters. Cape Canaveral was chosen, and development of the new facilities began, with Launch Complex 34 becoming operational during the fall of 1961 to launch the first Saturn I vehicles. Left, an aerial view of Marshall Space Flight Center. Below, left to right, closeups of the Administrative Center, Propulsion and Vehicle Engineering Laboratory, and the test area (the three large stands are, from left, the F-1 engine test stand, Saturn V dynamic test stand, and the Saturn V booster stand). 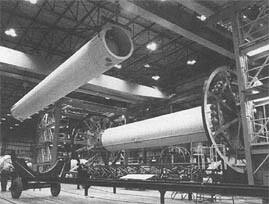 ....special industrial capabilities required for the unique sizes inherent in the Saturn program, including fabrication, manufacturing, and testing. There was a certain kaleidoscopic aura about all these arrangements, since some were accomplished entirely by the contractor on privately owned premises and others were undertaken in government-owned facilities, with the contractor supplying most of the work force. For example, the Saturn IB and Saturn V first stages were manufactured at the Michoud Assembly Facility (known familiarly as "Michoud") 24 kilometers east of downtown New Orleans. The prime contractors, Chrysler and Boeing, respectively, jointly occupied Michoud's 186 000 square meters of manufacturing floor space and 68 000 square meters of office space. The basic manufacturing building, one of the largest in the country, boasted 43 acres under one roof. By 1964, NASA added a separate engineering and office building, vertical assembly  building, (for the S-IC) and test stage building (also for the S-IC). By 1966, other changes to the site included enlarged barge facilities and other miscellaneous support buildings. Two things remained unchanged: a pair of chimneys in front of the Administration Building, remnants of an old sugar plantation. These ungainly artifacts served as reminders of Michoud's checkered past, from a plantation grant by the King of France in 1763, to ownership by the wealthy but eccentric New Orleans recluse and junk dealer, Antoine Michoud. Never a successful plantation, its sometime production of lumber and other local resources from the swampy environs helped generate the local slogan, "from muskrats to moonships." In contrast to Michoud, where the plant facility sat waiting, the development of the Mississippi Test Facility became a contest with Mississippi mud-to say nothing of the poisonous snakes and clouds of mosquitoes that plagued construction workers. Although NASA began  with a list of 34 potential locations, the site for test-firing Saturn V rocket stages logically had to be close to the production facilities at Michoud and also be accessible by water for shipment of S-II stages. Other criteria quickly ruled out most of the other contending sites. The test area had to be big. Size was a safety factor; test sites had to be widely separated from critical support and supply facilities in case of accidental destruction of a stage during a test run. More important, at the time the test facility location was being debated, NASA designers were looking ahead to big, deep-space booster stages of up to 111 million newtons (25 million pounds) of thrust, and lots of noise. Therefore, a test area of expansive proportions was required but in a location where a minimum number of people would have to be relocated. After juggling all of these requirements, in October 1961 NASA settled on a sparsely populated corner of Hancock County, Mississippi. A new, $300-million-plus space-age facility was hacked out of soggy cypress groves, Devil's Swamp, Dead Tiger Creek, and the Pearl River. By the intracoastal waterway and the Pearl River, MTF was only a 72-kilometer barge trip from the production facilities at Michoud, and was accessible by water to MSFC and the Cape. At the heart of MTF were the monolithic test stands: a dual-position structure for running the S-IC stage at full throttle, and two separate stands for the S-II stage. Laboratories, monitoring equipment, control center, and storage areas, including docks, were all deployed thousands of meters away. The MTF complex was tied together by 12 kilometers of canals (with navigation locks and a bascule bridge); 45 kilometers of railroads; and 56 kilometers of roads and paved highways. Under it all snaked 966 kilometers of cables, connecting test stands, laboratories, and data banks. Each month, MTF consumed enough electricity to keep 6000 households functioning. An arm of MSFC at Huntsville, MTF had an administrative pattern that was a bit unusual. A comparatively small cadre of NASA personnel (about 100) carried out overall managerial and supervisory duties. This select group also made the final evaluation of test results and issued the flight-worthiness certificates to the stage contractors. Approximately 3000 contractor personnel made up the vast majority of the work force. North American and Boeing each had several hundred people running their respective test stands. The General Electric Company, with over 1500 people, had the contract for housekeeping services at MTF and  provided maintenance for the facility and operational support at the test stands and elsewhere for the other tenants, including the construction firms. GE's range of support ran the gamut from 19 special items of cable equipment (for $ 1 183 187), to the always popular snake bite kits ($1.25 each). On occasion, GE hired cowboys to round up stray cattle in the outreaches of MTF, and it was GE that arranged for the transfer of the cemeteries during resettlement of the area's small towns. While these facilities were being developed, MSFC drew on experience, accumulated during the days of ABMA and the Army's arsenal concept, and developed the Saturn I-the vehicle originally designated as Juno V. On the threshold of starting to work on the large Juno V class of vehicles and other space hardware in 1959, Dr. Ernst Stuhlinger, von Braun's chief scientific advisor at ABMA, briefed NASA officials on the range of expected challenges and research required to develop vehicle components for space exploration. He noted the potential hazards from radiation, meteors, temperature extremes, and weightlessness. To cope with these environments, Stuhlinger stressed the need for research on a broad front, including special investigation into a list of 11 crucial materials and their current shortcomings in the space environment- from the decomposition of dielectrics and sealants, to unusual regimes of friction and wear for bearings and various moving parts, to the degradation of plastic and exposed surfaces, and to the vaporization and vacuum sticking of metals.38 Specific investigation of these and other problems moved on parallel tracks with the integration of components and materials into the launch vehicle design, even while the launch vehicle itself was taking form on drawing boards and in machine shops. Left, an aerial view of NASA's Michoud Operations. Below, the 124-meter-tall test stand at the Mississippi Test Facility is hoisting the first operational S-IC first stage for the Saturn V into test position. Bottom [left], the map shows the acoustic effects of an S-IC firing. Like most major development projects, the evolution of the Saturn I changed between conception and execution, although the configuration that emerged in 1958 was subjected to remarkably few major design variations before its first launch in 1961. The basic outlines for ABMA's concepts of the Saturn I (when it was still called Juno V) were sketched out in two reports to Advanced Research Projects Agency (ARPA) in October and November 1958; insights on various aspects of early design choices were provided by von Braun himself in ABMA's presentation to NASA in December 1958. For example, original concepts for yaw, pitch, and roll control called for hinged outer engines: two hinged for pitch; two hinged for yaw; all four for roll. But application of adequate control forces required fairly high deflection of the engine thrust vector, and the engine contractor (Rocketdyne) complained that this would put too much stress on propellant flex lines. Instead, gimbaling of all four outer engines was adopted, achieving adequate control force with less engine deflection. The gimbal system for mounting engines permitted each engine in the cluster to swivel about for either yaw or pitch control. On the other hand, the original multiengine concept was maintained. Throughout the early design phase, ABMA stressed the reliability of the multiengine approach in case one or even two were lost. Particularly in the case of manned missions, von Braun emphasized, the engine-out capability offered much higher margins of safety in continuing a mission until conditions were less hazardous for separation of the crew capsule. More than any of the Saturn vehicles, the Saturn I S-I stage configuration evolved during flight tests (for details, see chapter 11). NASA developed the Saturn I as first-generation and second-generation rockets, designated Block I and Block II. The first four launches used the Block I vehicle, with inert upper stages and no fins on the first stage, the S-I. Block II versions carried a live second stage, the S-IV, sported a corolla of aerodynamic fins at the base, and used uprated H-I engines. The S-I first stage for the Saturn I also became the first stage of the Saturn IB; in this application, it was called the S-IB. Again, there were modifications to the fins, engines, and various internal components. Nevertheless, the basic details of fabrication and testing of the Saturn I and Saturn IB remained similar. The first stage of the Saturn I and IB may have looked like a plumber's nightmare, but it fit the criteria of conservative design and economy established early in the program. As Marshall engineers discovered, development of a new booster of Saturn I's size involved a number of design problems. Fabrication of the tankage was comparatively easy. Even though the former Redstone and Jupiter tanks had to be lengthened from 12 to 16 meters to carry added propellants, the basic diameters of the 178-centimeter Redstone and 267-centimeter Jupiter tanks were retained, so they could be fabricated from the tooling and welding equipment still available at Huntsville. The tank arrangement settled on by MSFC gave an alternate pattern of the four fuel and four oxidizer tanks, clustered around the 267-centimeter center oxidizer tank. The oxidizer tanks carried the load from the upper stages of the Saturn, the fuel tanks only contributing to the lateral stiffness of the cluster. When filled, the oxidizer tanks contracted 63.5 millimeters, which meant that the fuel tanks had to have slip joints at their upper ends to accommodate other structural elements that fluctuated with the tank shrinkage. All together, the Saturn I first stage carried 340 000 kilograms of propellants in its nine tanks. To keep the propellant in one tank from depleting too rapidly during flight, which would seriously unbalance the vehicle, the Saturn I incorporated an interconnecting pipe system, with regulating equipment to keep propellants at uniform level in all tanks during a mission. Each of the four outboard fuel tanks fed two engines, yet interconnected with the other tanks. The 267-centimeter center liquid-oxygen (LOX) tank provided series flow to the four outboard LOX tanks, which also fed two engines apiece. Although the group of tanks eased the potential slosh tendencies of a single large tank, each separate cylinder contained fixed baffles, running accordionlike down the tank interiors. Pressurization for the LOX tanks was done by a heat exchanger, dumping it into the top of the LOX tanks as gaseous oxygen. Gaseous nitrogen from fiberglass spheres at the top of the booster pressurized the fuel tanks. The 48 spheres fixed to the top of the stage were curiously reminiscent of bunches of grapes. The cluster of tanks was held together at the base by the tail section  and at the top by an aptly named structural component known as the "spider beam." The tail section consisted of the thrust structure assembly as well as the heat shield, shrouding for engine components, holddown points, stabilizing fins (on the later Saturn I first stages), and other components. In the process of refining the design of the Saturn I, two major problems emerged: stability and base heating. As with most large rockets, the Saturn I was highly unstable, with the overall center of gravity located on the heavy, lower-stage booster, while the center of lift, in most flight conditions, was high on the upper stages. The nature of the problem called for more advanced control processes than used on aircraft and rockets the size of ICBMs. The low natural frequency of the big vehicle was such that when the gimbaled engines moved to correct rocket motions, special care had to be taken not to amplify the motions because the control system frequency was close to that of the vehicle itself. More worrisome, at least in the early design stage, was the problem of base heating. Even with a rocket powered by only one engine, the flow pattern at its base proved nearly impossible to predict for the various combinations of speed and altitude. Base heating occurred when the rocket exhaust interacted with the shock waves trailing behind the vehicle. This clash created unpredictable regions of dead air and zones of turbulent mixing. Heated by the rocket exhaust, the air trapped in these areas in turn raised the heat levels at the base of the rocket to undesirable temperatures. Worse, the fuel-rich exhaust flow from the engine turbopump could get caught in these "hot-spot" regions, causing fire or explosion. Successful ignition and operation of an eight-engine cluster of Saturn's dimensions required extensive testing beforehand. In December 1958, ARPA released funds for modifications to one side of a two-position Juno test tower in order to test-fire the Saturn I first stage. 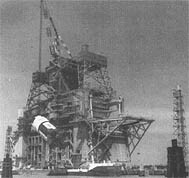 Preparations for these static tests, as they were called, required extensive reworking of the Saturn's side of the tower, including a new steel and concrete foundation down to bedrock, a steel overhead support structure and a 110-metric ton overhead crane, a new flame deflector and fire-control system, and much new instrumentation. The job took a whole year. By January 1959, ABMA crews installed a full-sized, high-fidelity  mockup of the first stage in the tower to check all the interfaces for service and test equipment. Satisfied, they took the mockup out, and put in the first static-test version. The test booster, SA-T, was installed during February, and late in March the first firing test, a timid one, burned only two engines for an eight-second run. Many skeptics still doubted that the eight-engine cluster would operate satisfactorily. "People at that time still had a lot of difficulty persuading individual rocket motors to fire up... reliably," von Braun explained, "and here we said we would fire up all eight simultaneously." There were a lot of jokes about "Cluster's Last Stand," von Braun chuckled. Still, the firing crew at Marshall proceeded cautiously. Not until the third run, on 29 April 1960, did test engineers fire up all eight barrels, and then only for an eight-second burst. By the middle of June, the first stage was roaring at full power for more than two minutes. To make the most use of the expensive test facilities, as soon as a booster completed its test-firing series and was shipped off to Cape Canaveral for launch, the SA-T booster was fastened back into place for further verification and testing of Saturn systems. The complex test instrumentation was complemented by the growing sophistication of automatic checkout systems used in the Saturn I first stage. Early hardware was designed for manual checkout. As more advanced electronics and computers became available, significant portions of the procedure were designed for automatic tests and checks. The scope of automatic test and checkout evolved into a complex network that tied together diverse geographic test and manufacturing locations. Later generations of Saturn vehicles and individual components were electronically monitored, literally, from the time of the first buildup on the shop floor until the mission was finished in outer space. Historically, the style of ABMA operations emphasized in-house fabrication and production, as Army arsenals had traditionally done. As the scale of the Saturn program increased, MSFC made the obvious and logical choice to turn over fabrication and manufacture to private industry. At the same time, the center retained an unusually strong in-house capability, to keep abreast of the state of the art, undertake preliminary work on new prototype hardware, and to make sure that the contractor did the job properly (for management details, see chapter 9). The do-it-yourself idea was most strongly reflected in the development of the Saturn I first stage. Ten Saturn I vehicles were built and launched; the first eight used S-I first stages manufactured by MSFC, although the fifth flight vehicle carried a contractor-built second stage (the Douglas S-IV). The last two Saturn Is to be launched had both stages supplied by private industry. Douglas supplied the S-IV upper stage, and the Chrysler Corporation's Space Division supplied the S-I lower stage. Left, the drawing of the Saturn I S-I stage shows the multitank configuration. The cutaway shows the fuel baffles inside the tanks. Below, in MSFC's Fabrication and Engineering Laboratory an S-l is being assembled. The two end spider beams are connected to the central 267-centimeter diameter liquid-oxygen tank; the first of the eight 178-meter outer tanks, used alternately for liquid oxygen and kerosene, is being lifted into position. Right, engineers in a Lewis Research Center wind tunnel are aligning a model of the Saturn IB prior to firing tests to determine the amount and distribution of base heating from the blast of the eight engines. Below, three Saturn IBs are in various stages of assembly at Michoud. ....vehicle was discarded, the major issue became Earth orbital rendezvous or lunar orbital rendezvous. One of the last holdouts against LOR, Marshall eventually opted for it because it averted the multiple launches of an EOR sequence and offered the best chances for a successful mission before the end of the 1960s. Once the issue of the mission profile had been settled, the task of developing the resources for manufacturing and testing of the Saturns became paramount, and engineers finalized the design of the Saturn I's first stage, which evolved into the first stage of the Saturn IB as well. At this point, in the early 1960s, development of the Saturn I and IB loomed large in press releases and news stories, with special attention on  the lower stages. The work in this area set the baselines for manufacturing procedures, static firing tests of the multibarrel cluster, and the first launches of the Saturn I, with a live lower stage and a dummy upper stage. Because NASA and MSFC planners put such special emphasis on early static-firing tests of each stage, the engines had to be ready. From the beginning, MSFC maintained a strong effort in research, development, and production of Saturn propulsion systems. Meanwhile, parallel work on other hardware of the Saturn program proceeded: R&D on the upper stages for the Saturn I and IB (to be modified for the Saturn V); R&D for the first two stages of the mammoth Saturn V; plans for unique tooling required for production and fabrication; schemes for guidance and control of the launch vehicle. The main effort leading to large launch vehicles for manned lunar voyages was just beginning to build momentum.